Before you can clean an abalone, you need to get an abalone. Commercial fishing or diving for abalone is illegal on the West Coast, where abalone live and grow. Recreational abalone diving is tightly regulated where it is allowed. To meet the demand from people who love abalone but aren't fit (and crazy) enough to dive for them, clever folks have figured out how to farm abalone. Abalone grow slowly and the process of raising them is a laborious one. In short, if you have a fresh abalone, either you dove for it, someone who must love you dove for it, or you spent a pretty penny buying a farmed one. In any case, you'll be happy to learn that cleaning it and preparing it to be cooked is a surprisingly easy process. Use a wide, flat wooden spatula or similarly thin, blunt tool and work it between the abalone and its shell. The abalone attaches to its shell with a solid round muscle at the bottom, everything else is just clinging to the shell. Work open a section between the abalone and the shell, and then firmly but gently work the spatula around and along the shell until the abalone detaches. Push against the shell with the tool rather than the abalone for easiest release and to keep the abalone whole. Once you've pried the abalone from its shell, slide it out. Set the shell aside - you can scrub it clean and air-dry it for decorative use if you like. You can do this work in the sink. The next step is removing the guts from the abalone and working in the sink helps to keep clean-up quick and easy. Hold the main body of abalone and let the viscera (the guts) hang down over a sink or bowl. Use a sharp knife to cut off the viscera. Discard the viscera. * Use the food disposal, if you have one, or enclose it in 2 plastic bags to avoid stinky trash. *In some Asian cuisines, abalone viscera are prized and used in soups and stews. If you or someone you know likes abalone guts, by all means, don't discard them! 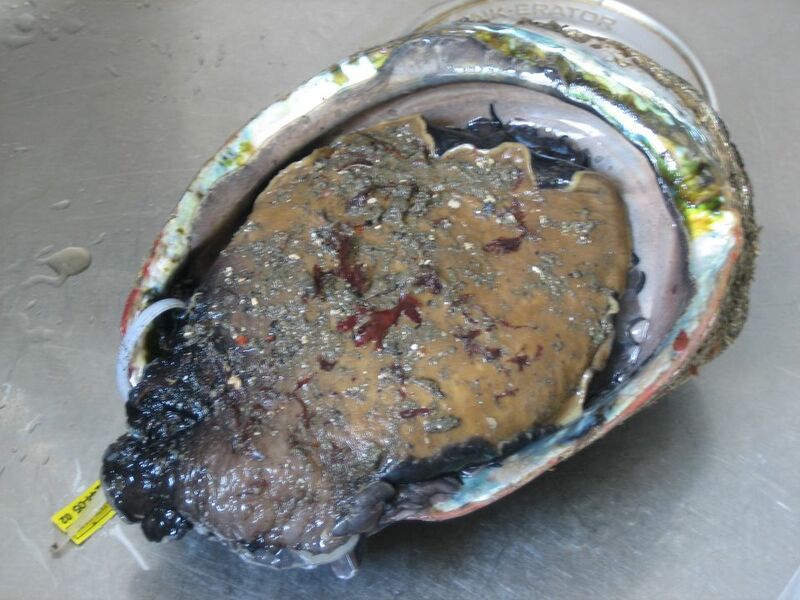 Wild abalone tends to have a layer of black stuff on its sides. Part of this is just the edge of the abalone, and some is a film. You want to remove both parts because it's icky looking and bitter tasting. The quickest solution is to simply cut off the black edges, and it's the method many people use. You can also take a bit more time and scrub off the black film along the sides of the abalone. While they are perfectly edible, if a tad rough and tough, most people are going to enjoy their abalone more if you cut off and discard the curled edges (aka the "lips") and the tough, pointed end. Check it out. From an in-shell prehistoric-looking monster shellfish to a whole, cleaned abalone all clean and pretty and ready to cook. If you are at all in doubt, make classic Pan-Fried Abalone.